How will the phosphorescent emitter market look in 2018, following UDC's basic material patent expiration? The phosphorescent OLED emitter market is currently dominated by Universal Display who owns the basic patents to phosphorescent OLED emitters. All the major OLED makers (including Samsung and LGD) are using UDC's materials in order to achieve higher display efficiencies, beyond what is available from fluorescent emitters. Universal Display holds over 4,000 issued and pending patents, but some of its basic phosphorescent patents are set to expire by the end of 2017. Honestly, it is very difficult to know exactly what effect this will have on the market - some analysts believe that it will carry very little effect while others say that this will open the door for other companies to sell competing phosphorescent emitters. A few days ago, I was told by an industry insider that one of the OLED display makers aims to adopt a new phosphorescent emitter in a display that will be out in early 2018. This is a PMOLED display and the emitter producer is, if I understand correctly, Merck. This is not the first time we hear that Merck is readying its phosphorescent emitters for a 2018 release, but this is the first time we have such a confirmation. This is a very interesting development. From our understanding many PMOLED displays currently do not use any phosphorescent materials - sacrificing the added efficiency - due to the high costs related with such materials today. The PMOLED market is very price sensitive as it faces competition from low cost LCD displays. Many PMOLED displays are used in mobile devices (fitness bands, for example) so the efficiency is of high importance, which is why PMOLED makers are always on the look out for new technologies to improve the efficiency of their displays. 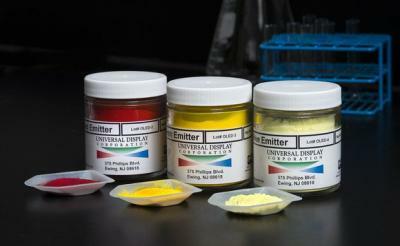 Of course lower-cost phosphorescent materials are also attractive for AMOLED makers - and more on that below. One possible next-generation emitter system is TADF. Wisechip is set to release the world's first HF-TADF based display by the end of year, which will give them a 100% boost in efficiency compared to the current fluorescent emitter based devices. A competing phosphorescent emitter may be a great solution as well, to complement next-generation TADF and HF emitter systems. To my understanding, while some of UDC's patents are indeed set to expire soon, the company has a vast range of other patents and technologies that it has spent years to develop and acquire - relating to new emitters, new architectures and new production processes. This means that even if one will be able to produce a phosphorescent emitter in 2018, it is likely to still be inferior to UDC's state of the art materials. For most AMOLED applications (think Apple iPhones, Samsung flagship phones and LG's OLED TVs) the high cost of UDC's materials are well worth the extra money if they provide a superior solution (in terms of color purity, efficiency, lifetime and maturity) - but for some applications a lower-cost system may be the right choice. This could be great news for the OLED industry if true. Some AMOLED displays are already adopted in budget smartphones, for examples (such as the 2017 Samsung J1). For such phones, AMOLED makers may be willing to sacrifice performance and efficiency for a lower-cost material solution. I could not get a comment from Merck regarding this development, but Universal Display did issue us the following response: "As the pioneering leader in phosphorescent OLEDs (PHOLEDs), we believe that our broad, extensive and growing IP portfolio of over 4,500 patents (issued and pending worldwide), including new architecture and material patents that are being added continuously, and our 20+ years of technology know-how, are critical to the commercialization of OLEDs into the marketplace. Our strong intellectual property fortifies our continued leadership position well beyond 2018. Additionally, our ability to consistently develop and deliver new and next-generation emitter offerings that exceed the ever-demanding and ever-changing specs for new display and lighting products reinforces the strong barriers of entry our IP has created. We believe that our proprietary materials and technology add robust performance and efficiency value at a very small fraction of the overall cost of the OLED display module. We are dedicated to continued innovation and delivering our breakthrough developments to the OLED industry." We have discussed phosphorescent OLED patents with Andrew Abrams, Principal at SCMR LLC - a display and lighting supply chain analyst. Here's Andrew's take on this development: "From a practical point however, there are really two patents types at play here. 1) The material OLED patents, which define composition from a chemical and structural standpoint, and 2) the ‘use’ (RM: Architecture) patents which govern how phosphorescent materials can be used to create OLED devices. While each country’s patent office rules on these relatively early patents individually, and each has their own biases, most have either let the patents stand or limited their scope to specific heavy metals, of which iridium is the most important. These patents protect the use of phosphorescent materials to produce an OLED device, which means should a specific material patent expire, a producer using that formula to produce an OLED device would have to pay a license fee, albeit smaller, for the ‘use’ of the idea. Without this fee, the material could be made but not used by commercial brands. While there are literally millions of other possible organic combinations that could be substituted for those specified in the UDC patents, few have been able to match the characteristics needed for displays, particularly those of stability, which is the hallmark of material lifetime." It will be very interesting to see how the emitter market will develop in 2018/2019, with new TADF and alternative phosphorescent solutions finally available. Samsung and UDC are set to renew/extend their current licensing agreement by the end of 2017 (or sign a new one) as well, and when this happens it will be an important clue as to the status of competing solutions. Ron, normally you have a disclaimer saying the author of this article is a holder of UDC stock. I did not see it here... does this mean you a no longer a holder of UDC stock? Yes, I no longer have any shares. It is most likely that the smart execs at UDC have bundled with their licensing agreements their initial patents with the fairly well researched and patented subsequent IP to the point that soon expiring patents are not fundamental older patents are not going to be worthless and circumventible. Time will tell. "Honestly, it is very difficult to know exactly what effect this will have on the market - some analysts believe that it will carry very little effect while others say that this will open the door for other companies to sell competing phosphorescent emitters." Who are the others that say this will open the door?? I'm sorry Steve, I cannot disclose the analysts I discussed this with, but that's what I heard from some of them.